Muscatine, as a community, has had several names including Casey’s Woodpile, Newburg and Bloomington, but none of those names could describe a place as great as Muscatine. Residents kept searching for the perfect identity for their little town. They looked for a name that would be distinctive and set the community apart from all others. Muscatine is said to have been derived from the Mascoutins, a small band of Indians who lived in the area during the early 1800’s. Other sources say Muscatine came from an Indian word which meant “island of fire,” in reference to an area south of town which at one time was cover by a slough. When the sun would set over the slough, the whole area would reflect the deep and vivid colors of the setting sun making it seem as though it was on fire. 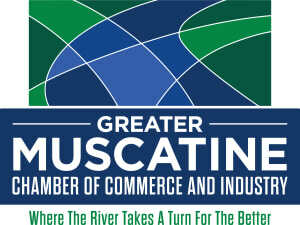 Perhaps, Muscatine’s history can best be told through the different industries that have gained prominence here—ones that have relied on the Mississippi River to provide raw materials and as a means of transporting goods to and from other parts of the country. The first people of European descent came to the area to trap fur-bearing animals to sell in the European fur-trading industry. The next to arrive were the loyal soldiers who established outposts along the wild frontier to protect the nation’s flank from warring Indian tribes. After peace was brokered between the Indians and the U.S Government, pioneers began settling in the area, laying claim to the fertile land which was reportedly great for farming. Soon, there was a demand for goods that stretched in every direction. Raw materials required to meet those demands were plentiful in the Mississippi River Valley, as were workers looking to earn good wages. The lumber industry boomed in Muscatine’s early days. Logs were floated down river to Muscatine where they were milled into board lumber, doors and window sashes. Lumber barons became extremely wealthy supplying construction materials for all of the new houses and barns being built in the region as each new settler strived to achieve the American Dream. A drive through Muscatine’s historic neighborhoods, which are filled with magnificent homes, is proof the wealth that was created within the community. As you visit Muscatine’s historic sites and you gaze upon the beautiful Mississippi River Valley, consider those who have come before, and the indelible mark they have left upon the community.